There are about 20 different species of daddy longlegs spiders or cellar spiders in the U.S. They are more of a nuisance because of the immense amount of webs they produce. 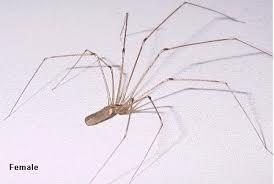 Daddy longlegs have long legs about 2-8mm in length and are off brown colored. They are usually found along basement ceilings and front porches.